We’d love your help. 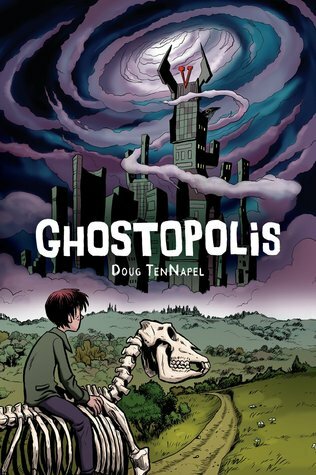 Let us know what’s wrong with this preview of Ghostopolis by Doug TenNapel. To ask other readers questions about Ghostopolis, please sign up. I LOVE THIS BOOK SO MUCH!!!!!! YOU LITERALLY HAVE NO IDEA HOW MANY TIMES I'VE READ IT!!!!!! Does anybody else like it? It doesn't make sense that Joe made Ghostopalis, Why can't there be more info on Joe? Enjoyed this, but I felt that at times it was a bit too all over the place. This was a fun read. I didn't know what to expect, but this was a bit of a surprise. It almost had a little 'Matrix' feel to it and Garth, our main character was a little bit like Neo. There is an agency that keeps the ghost world out of the human world. One day, an officer makes a mistake and sends a human boy, Garth, to the land of the dead. Garth finds that he has powers over there. The story moves a lot and I feel it might have been better in two parts or something. Garth meets all kinds of p This was a fun read. I didn't know what to expect, but this was a bit of a surprise. It almost had a little 'Matrix' feel to it and Garth, our main character was a little bit like Neo. Garth meets all kinds of people in the Ghost world. There is also a city called Ghostopolis and he needs to save it. My Brontë loved this graphic novel, and I can see why. It's a feel good story full of classic "monsters" -- mummies, skeletons, goblins, demonic insects -- but they're all cleaned up and as unscary as can be. There is a simplistic good versus evil tale going on (albeit with a nurture rather than nature bent). There is a lovable grandfather, who was a poor father, looking for and finding redemption. There is a sacrifice for love. It hits all the right notes for the kids who are its target audienc My Brontë loved this graphic novel, and I can see why. It's a feel good story full of classic "monsters" -- mummies, skeletons, goblins, demonic insects -- but they're all cleaned up and as unscary as can be. There is a simplistic good versus evil tale going on (albeit with a nurture rather than nature bent). There is a lovable grandfather, who was a poor father, looking for and finding redemption. There is a sacrifice for love. It hits all the right notes for the kids who are its target audience. Unfortunately, it's all too Eisner-Disney for me. It's too scrubbed, too sanitized, too simplified, too happy, too sweet. If it were a sandwich it would be two pieces of Wonderbread with peanut butter and jelly slathered an inch thick between the slices. That's too much for me. These days I like me pb&j with minimal goo in the middle. It was ok. Nothing that will leave a lasting memory on me unfortunately. I do think this one would be more enjoyable if I were younger. I'd recommended it for anyone eight and up. Edit: It's been a week and I literally forget everything about this graphic novel. I'm knocking it down to two stars. It probably deserves higher but if I can't remember it after only a few days than it really didn't mean much to me. I also heard the author (who also created the Sega video game - Earthworm Jim) is kind It was ok. Nothing that will leave a lasting memory on me unfortunately. I do think this one would be more enjoyable if I were younger. I'd recommended it for anyone eight and up. I recently bought a pack of TenNapel books from Scholastic, and this book was included, so I decided to read it again. I'm not a huge fan of graphic-novels, but I like the way TenNapel writes. I have an easy time following the story and never feel overwhelmed by words and pictures. The stories are very creative. Can't wait to share this with my students! I know they'll love it. I started reading this and wasn't very interested. In fact, I read the first 10 pages and set it down for a week. I randomly picked it back up and started reading and was soon hooked. The story progressed so smoothly and was interesting. Frank is a paranormal detective, responsible for sending ghosts back to the "other side." He accidentally sends Garth, a mortal to the other side and has to go find him. In the land of the dead, an overlord mercilessly rules everyone. Garth may be the only one that can stand up to him. There are a lot of little side stories and analogies that you can think about. For instance, Joe, is the creator of Ghostopolis and he tells Garth "I know a lot of things about you, Garth, and I'm rooting for you anyway." Joe is this all-powerful guy, but he lets Garth fight his own battles and because of that Garth learns his own strength. Take what you will from that. I recently read The Sandman, Vol. 1: Preludes and Nocturnes and was horrified by the gross story, but the illustrations were pretty good. The illustrations in Ghostopolis were not as nicely done, but the story was infinitely more enjoyable. It's written for a younger audience, so it's more simplistic, but there is enough to keep adults interested. I'm beginning to think Dough TenNapel is my new favorite middle grade graphic novel author. The first book I read from him 'Cardboard', was really good and it had a Pinocchio vibe. This one reminded me on the Wizard of Oz. Ghostopolis is about a boy named Garth and he has an incurable disease. The doctors do not have a time frame for when he will pass on. Frank Gallows is a ghost wrangler. He catches ghosts that have illegally crossed over and cuffs them. Sending them back to the afterlife. While I'm beginning to think Dough TenNapel is my new favorite middle grade graphic novel author. The first book I read from him 'Cardboard', was really good and it had a Pinocchio vibe. This one reminded me on the Wizard of Oz. Frank Gallows is a ghost wrangler. He catches ghosts that have illegally crossed over and cuffs them. Sending them back to the afterlife. While Frank is capturing a ghost horse, Garth gets trapped with said horse and is sucked in the the afterlife where he meets all sorts of spirits. His grandpa, a bone king and a terribly corrupt ruler named Vaugner. It's up to Frank to say Ghostopolis and rid them of the evil Lord. Auch beim Wiederlesen kommt Ghostopolis nicht über drei Sterne hinaus. Die Story ist witzig und kann mit vielen netten Details und Ideen aufwarten, trotzdem fehlt aber das gewisse etwas, das mich dazu motiviert, bei der Stange zu bleiben. Wäre es ein Film, dann die Sorte, bei der ich zwischendurch aufstehe, mir eine Stulle schmiere oder einen Tee koche - man verpaßt ja nicht wirklich etwas. Und die Zeichnungen sind leider mit Ausnahme einiger Panels, die wiederum auf witzigen Ideen basieren, auc Auch beim Wiederlesen kommt Ghostopolis nicht über drei Sterne hinaus. This book was heartwarming! I loved how Claire and Frank end up together in the ghost city. I loved how Garth's mom and grandad forgive each other.I loved this book a lot! I loved that Garth knows he won't give up fighting this sickness he has. Also how Claire's grandfather is a werewolf is awesome and how Claire is the Queen of the undead. I mean that's really cool! Rounding out my recent foray into Scholastic's impressive Graphix line, here's a great one for fourth graders up that touches on life and death, family dynamics, romance, theology and the Tuskegee airmen. Combine that with TenNapel's wonderful drawings of zombies, mummies, skeletons and other denizens of afterlife, and you can't go wrong. This is the story of Garth Hale and how he accidentally ended up getting transported into the world of the dead (as you do). He's a young boy who's not the most optimistic or happy upon Earth due to an illness he has, but when he's transported away to Ghostopolis he comes into his own adventure against evil bugs, riding skeleton horses and generally trying to escape. I liked the story and it was certainly fun in places but I didn't feel like there was a whole load to comment on because it's not t This is the story of Garth Hale and how he accidentally ended up getting transported into the world of the dead (as you do). He's a young boy who's not the most optimistic or happy upon Earth due to an illness he has, but when he's transported away to Ghostopolis he comes into his own adventure against evil bugs, riding skeleton horses and generally trying to escape. I liked the story and it was certainly fun in places but I didn't feel like there was a whole load to comment on because it's not too unusual an idea. I think it's a pretty fun idea because the afterlife is imagined in vivid colours and tones, but I just felt like it was light and fun and not much else. The art style of this book is okay, it's got some really great colours but I find the way that the people are drawn by Doug TenNaple a little bit too cartoon-y for my own taste. I do think that the surreal afterlife scenes are a lot more vivid and well drawn than those set on Earth due to the natural creativity of the afterlife, but even so the art style is just okay not amazing. On the whole for a quick, light and fun read I think this ticks a lot of boxes but it's not a favourite of mine. There's a fun but slightly predictable storyline and there are some cool elements within that, but at the end of the day it's not original enough to be awesome. It's a children's graphic novel for sure, and it seems like a light and fun one for that age group but I have to say I much prefer Cardboard by Doug TenNaple as I felt that was far more imaginative and unique. Not only was the love story rather empty and trite, it caused an offensively arbitrary scene where the girl for absolutely no reason, completely interrupting the plot except to further the stupid love story in the most unimaginative and sexist way, suddenly changes into a dress because girls only care about dresses and the only way for men and women to interact is for the man to tell the woman that she looks good because of the dress and the woman to be genuinely flattered. WHAT YEAR ARE YOU WRI Not only was the love story rather empty and trite, it caused an offensively arbitrary scene where the girl for absolutely no reason, completely interrupting the plot except to further the stupid love story in the most unimaginative and sexist way, suddenly changes into a dress because girls only care about dresses and the only way for men and women to interact is for the man to tell the woman that she looks good because of the dress and the woman to be genuinely flattered. WHAT YEAR ARE YOU WRITING THIS DRIVEL TENNAPEL? Ghostopolis is a fun, but a bit childish book about the afterlife. The genre of Ghostopolis is fantasy graphic novel. The book takes place in a world where when you die, you go to Ghostopolis where all the dead live. However, the dead can sneak through holes and come back to life on earth. Frank Gallows and the SITF are in charge of zapping them back to Ghostopolis. The main character is a normal kid named Garth who lives with his mom and is diagnosed with an incurable disease. One day, Frank me Ghostopolis is a fun, but a bit childish book about the afterlife. The genre of Ghostopolis is fantasy graphic novel. The book takes place in a world where when you die, you go to Ghostopolis where all the dead live. However, the dead can sneak through holes and come back to life on earth. Frank Gallows and the SITF are in charge of zapping them back to Ghostopolis. The main character is a normal kid named Garth who lives with his mom and is diagnosed with an incurable disease. One day, Frank messes up and accidentally zaps Garth and the undead horse who fell on top of him into the afterlife and the SITF try to save him. Garth learns that he has powers, and the leader of ghostopolis, Vosch, wants to use his powers to become a feircer ruler of Ghostopolis. Will Garth go back home, will the disease kill him, or will he be in Ghostopolis forever? I picked this book up at the library on a whim and I am so glad I did. This was a wonderful story with some great illustrations. The story is meaningful, fun, and quirky all at the same time. Garth is a kid with problems, he has a life-threatening condition that no doctor can solve. Imagine his surprise when he is accidentally zapped into the Ghost world by an accident prone ghost hunter. While there Garth learns he has fantastic powers and ends up facing off against Ghostopolis's evil ruler. Gar I picked this book up at the library on a whim and I am so glad I did. This was a wonderful story with some great illustrations. The story is meaningful, fun, and quirky all at the same time. Garth is a kid with problems, he has a life-threatening condition that no doctor can solve. Imagine his surprise when he is accidentally zapped into the Ghost world by an accident prone ghost hunter. While there Garth learns he has fantastic powers and ends up facing off against Ghostopolis's evil ruler. Garth learns a lot about his family's past and about himself while he is there. Now Garth needs to figure out how to get back. I loved the idea behind this story. How cool that Garth gets zapped into a ghost world and finds out that he has super hero like abilities there? I also loved Garth's faithful skeleton horse, that horse was awesome and added a lot of fun to the story. The story is suprisingly complex and creative. I was drawn into it right away and had to read the whole thing in one sitting because I just could not put it down. This is one of those graphic novels that will appeal to a broad range of ages. Depending on the age of the reader different messages can be taken from the book. At the most basic level it is a fun and engaging story about the adventure of a boy in a ghost world; on a more complex level is explores questions behind death and what happens after life. The drawings were very well done. I never had trouble following them or figuring out what was going on. The characters were drawn very expressively...even the horse made out of bones had a ton of personality. So, I just really enjoyed it. This was my 15th book for the YALSA Best Books challenge. So basically there are a lot of things going on all at once (like with any good book). First of all you have a ghost hunter named Frank Gallows who goes around and zaps ghosts back to a ghost world where Ghostopolis is the main city. Then you have a kid named Garth who has some incurable disease and his mother who drags him to five doctors to try and find some hope of a cure. Well things get a bit jumbled when Gallows sends a skeleton hor This was my 15th book for the YALSA Best Books challenge. So basically there are a lot of things going on all at once (like with any good book). First of all you have a ghost hunter named Frank Gallows who goes around and zaps ghosts back to a ghost world where Ghostopolis is the main city. Then you have a kid named Garth who has some incurable disease and his mother who drags him to five doctors to try and find some hope of a cure. Well things get a bit jumbled when Gallows sends a skeleton horse back and accidentally sends Garth with it. Now Gallows must ask his ghost friend Claire Voyant to help him save Garth and Ghostopolis before the evil Vaugner destroys them both. Well, there is a lot more going on...but you get the gist. This is a cute story. Garth is a terminally ill boy who gets trapped in Afterlife while he's still alive because an RIPD type dude accidentally sends him back while sending a "nightmare" back at the same time. So we visit Afterlife where the rules are reversed - i.e. living people can fly and go through walls and have magic - things the dead can do in our world - and it's all powered by imagination which, naturally, Garth has in abundance and he's uber-strong, a "natural talent", and, with help, This is a cute story. Garth is a terminally ill boy who gets trapped in Afterlife while he's still alive because an RIPD type dude accidentally sends him back while sending a "nightmare" back at the same time. So we visit Afterlife where the rules are reversed - i.e. living people can fly and go through walls and have magic - things the dead can do in our world - and it's all powered by imagination which, naturally, Garth has in abundance and he's uber-strong, a "natural talent", and, with help, he takes on the big bad of the world. The Afterlife itself it pretty cool. There's ghostopolis, but there's also Mummyville and the Bone Kingdom and some other stuff, so different types of dead and some mythological type things are portrayed in different ways, but there seems to be very few actual ghosts, which was kind of weird. Is Gallows's body in the afterlife with him, or did it get mashed into microscopic pieces in the rubble? Where do ghosts go when they disintegrate? Why are there only three to four ghosts in the afterlife, with the exception of the God conga line towards the light, and a bunch of other "types" of dead people? Why can't a (probably) children's graphic novel pass the Bechdel test or show a little diversity? It seems that only white people die, so that's good news for everyone else in the world. Who names a protagonist Garth? As a whole, the pacing was too fast, things were moved along with little development or explanation (humans have magic powers in the afterlife for some reason) and it reeked of Deus Ex Machina. Boy who has an incurable disease is The Chosen One amongst the dead, but he's not dead so he has extra superpowers! Boy defeats the Evil Not White Guy with friendship, imagination, and pure willpower! Forbidden human-ghost love subplot between some adults that gets remedied during the adventure and they live Happily Ever After ruling the afterlife! Boy's incurable disease gets cured because some random dead guy says so! Frank Gallows, a longtime ghost hunter has really done it this time, sending a living person to the afterlife. What a loser! Now he is really going to get fired, so he enlists his ex to help save the day. Garth, a terminally ill boy, is accidentally zapped to the afterlife prematurely. At first he just wants to find a way home, but as he spends more time in the afterlife he realizes he may be able to help. Cecil, Garth’s grandfather, totally failed at life and his family. But through this terrible Frank Gallows, a longtime ghost hunter has really done it this time, sending a living person to the afterlife. What a loser! Now he is really going to get fired, so he enlists his ex to help save the day. Cecil, Garth’s grandfather, totally failed at life and his family. But through this terrible accident he is able to meet his grandson for the first time, and possibly repair broken relationships. In the end, nothing is resolved in the way one would guess, but it ends up being even more amazing. Why I picked it up: I’m still on my graphic novel binge, so I decided to read this one since it has been in my pile for a while. I’ve been putting this one off, but now I have no idea why! Why I finished it: The story was surprisingly original, and the graphics were complex and engaging. There were a few times I just took a moment to soak it all it. Who I’d give it too: Anyone who loves a good graphic novel that deals with the afterlife and other spooky stuff. I'm surprised at how good this was. It looks kiddie, and is kinda kiddie, but the story is well thought out and the bad guys are enjoyably evil, and i just kinda loved it. Basically its the story of this kid, Garth, that finds himself in the afterlife. One problem, he's still alive. In this afterlife, there are seven kingdoms at the hub of which, Ghostopolis sits, all led by the evil Vaugner. Whats really cool about it is the magic system. Basically humans in the ghost world don't abide by afte I'm surprised at how good this was. It looks kiddie, and is kinda kiddie, but the story is well thought out and the bad guys are enjoyably evil, and i just kinda loved it. Basically its the story of this kid, Garth, that finds himself in the afterlife. One problem, he's still alive. In this afterlife, there are seven kingdoms at the hub of which, Ghostopolis sits, all led by the evil Vaugner. Whats really cool about it is the magic system. Basically humans in the ghost world don't abide by afterlife physics, so they can walk through walls, fly, shoot plasma beams from their hands, anything they imagine. Its a constantly fun and surprising aspect of the book. Especially in the final battle, where Garth and Vaugner literally morph their bodies into the buildings of Ghostopolis and battle Transformers-like. Ghostopolis, is an amazing book. It is about a human boy, Garth, who gets caught in a ghost trap gets sent to Ghostopolis. It is a place for the afterlife where people are ruled by Vaugner the evil leader. Garth has to get back to his mother. With the help of his friends he manages to get back home and defeat Vaugner. This book was very hard to put down. It is filled with adventure. It was interesting book. The last moment that all the misunderstanding between Garth's mother and her father was great ending. Also, all the Garth's works that he done for the 'Afterlife' even he had serious disease are great too. I will be seeking out more TenNapel books. Fun, well told, art really enhances the story, and all-ages appropriate while still being a good story. And Skinny the Horse is awesome. This graphic novel is geared toward middle school age boys. There are common mentions of farting, poop and diarrhea. Not my thing but I was looking for a book for a middle school boy who is learning English and needs a book with simp!e language and appropriate for his age group. I think he will like this book. The graphics are appealing and the humor is simple and actually the equivalent of an eight year olds. Still. I feel there is an audience for this graphic novel. OMG, tohle bylo boží. Promyšlené, dobře vykreslené charaktery, napínavé a místy až mrazící. Magnifique! Part of the 'new' graphic novel collection at MHFG! Doug TenNapel is the Eisner Award winning writer/artist of over sixteen graphic novels. He is published by Image Comics and Scholastic/Graphics. He's been married for 27 years to the love of his life and has four book-loving kids. Doug's favorite authors include G.K. Chesterton, C.S. Lewis and J.R.R. Tolkien. He reads mostly philosophy but tends to get his fiction from audio-books. His performs live Doug TenNapel is the Eisner Award winning writer/artist of over sixteen graphic novels. He is published by Image Comics and Scholastic/Graphics. His performs live art demonstrations on his Facebook page, and has animated using pixel art for clients like BlueSky software and Electronic Arts. He also regularly posts on his Youtube channel. Doug tries to write and draw something every day as a discipline that also happens to be a career.